Any handmade piece of work, be it art or furniture is not complete without the touch of an abrasive. 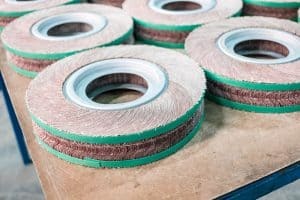 The application of abrasives is so prevalent today that we sometimes even tend to discard some of them as not being one. So what exactly is an abrasive? In simple terms, it is a material often a mineral that is used to rub against another surface to finish or shape a work piece. The rubbing off this material leads to the work piece being worn away due to friction. The use of abrasives can be to attain a rough surface such as in the case of satin or beaded finishes and even to achieve a smooth and reflective surface. You can buy abrasives in Brooklyn, NY for whichever purpose you have. Not only do they come in various designs, they are also available depending on the type of work you are doing and your mastery of a certain tool. Buy Abrasives in Brooklyn, NY. Types of Abrasives on the market. These sanding products are used in times where the quality of the finished goods is very important. It’s also quite efficient when it comes to the removal of surface defects. Here the use for the disc will determine the backing to be used. Buy Sandpaper in Brooklyn, NY. This is one of the most popular sand paper abrasives the world over. It’s generally a hard paper with different materials on the surface to properly smooth out a surface. Can be made of ceramic, aluminum oxide, silicon carbide etc. Sanding belts are most popular when it comes to removing certain materials on the surface on an object. The materials used on this abrasive are similar to the one on regular sandpaper. The grinding wheels are definitely the kings of abrasives. These wheels are best known for their efficiency and long-lasting nature. They can also be used to cut and grind down objects. Today due to the evolution of technology, people working in the crafts industry now have a wider range options to buy abrasives in Brooklyn, NY. There are a mixture of functionality, quality and also life expectancy of the abrasive in question. Naturally occurring and synthetic abrasives. Abrasives can be naturally occurring or man-made, also referred to as synthetic. Some of the synthetic ones can be very identical to naturally occurring abrasives; however, they cannot be called natural abrasives as they do not arise naturally. An example of a very hard and durable natural abrasive is diamond. However, using a diamond is not feasible as it is very expensive to buy abrasives in Brooklyn, NY. Also, natural ones may contain impurities, therefore, are not as feasible. Examples of synthetic abrasives include ceramics, aluminum oxide or silicon. Bonded abrasives are those that are contained within a matrix. The matrix is called a binder, and the mixture of the binder and abrasive is usually shaped sticks, blocks or wheels. A coated abrasive is one which makes use of a backing material such as paper or cloth. The abrasive is fixed on this material using an adhesive. A very common example of such is sand paper. These abrasive products are here to stay. Due to how they are made, and the materials used to create them, not all abrasives are made equal. Here are some of the applications and which ones work better with which material. One of the most impressive things an abrasive can do is cut through sheets of metal and plastic without much effort. Especially when coupled with a high powered cut-off wheel, it can cut right through plastics and sheet metal quickly and quietly. These can be made out of aluminum oxide in regards to carbon steel and a blend of zirconia alumina and ceramic aluminum oxide for exotic metals and carbon steels. If you want to handle some grinding, buying abrasive is also the way to go. Due to their rough surfaces, they are the perfect tools for evening out surfaces and making them a lot smoother. Here, the most used abrasive product is the depressed center grinding wheel which comes in either 24 or 36 grit. For a grinding project, you need something that’s stronger and courser than your target. So, a blend of zirconia alumina and ceramic aluminum oxide for ferrous metals and stainless steel materials. For other stronger materials such as alloys, you can use an abrasive material made of a mix of premium aluminum oxide grains and zirconia alumina. If you are interested in blending welds or light stock removal, the see-through fiber discs are a good way to gravitate towards. Here, you will use ceramic alumina to deal with ferrous metals and stainless steel. If you want something with lower pressure, but just as efficient, the ceramic and zirconia blend will work just fine.